If you’re looking for an IP camera for home security, you'll want to know about Homeboy. It remedies almost every drawback I’ve seen in security cameras. It doesn’t cost a fortune. And you’ll be able to buy one soon—without having to participate in a crowd-funding campaign. If Homeboy looks familiar, it's because it built on the intellectual property developed for the Hive camera that garnered a lot of attention about two years ago, but that was ultimately never brought to market. I spent some hands-on time last week with a production-level Homeboy and a beta version of the iPhone app that goes with it (which is why this isn’t a formal review). The Homeboy, roughly 2.5 inches in diameter, is deceptively simple-looking. Its eyeball-like industrial design reminds me of the old Connectix Quickcam from 1994. The similarity ends there. Homeboy runs on a rechargeable battery, so you can put it virtually anywhere indoors (it’s not weatherized against the elements). It eliminates the expense associated with a monitoring service that can contact an emergency dispatcher, but it delivers some of the most important benefits a paid monitoring service provides. It can function as a stand-alone device, or you can integrate it into your home-control system to trigger other devices, such as a light switch. It sends video clips (with optional audio) to your smartphone. It can be armed and disarmed using geo-fencing, so you don’t need to remember to activate it every time you leave your house. It’s outfitted with basic night vision, so it can operate in the dark. It has a motion sensor, a mic, and a built-in siren to let intruders know they’ve been detected. And you can deploy an almost unlimited number of Homeboys at a single location without worrying that you’ll overwhelm your Wi-Fi router. A battery-powered Wi-Fi camera. Seriously? I’ve kvetched about how power-hungry Wi-Fi can be, so I was surprised when Homeboy inventor Mark Richards told me the camera operates on battery power. It seems he's been working to develop very-low-power Wi-Fi technology for some time. Richards says the camera will operate up to three months on a full charge. That’s impossible, right? A camera that’s powered up and streaming video to the cloud 24/7 wouldn’t last a day on battery power, much less three months. The Homeboy captures and sends video clips. It's not designed for remote log-in and real-time monitoring. That’s the Homeboy’s first trick. It’s also the factor that will immediately remove this device from consideration if you’re looking for a conventional IP camera. The Homeboy spends most of its time in sleep mode, waking only while armed and after it detects motion. When something moves in front of the camera, it boots up in just 500 milliseconds to capture a snippet of video and operate its siren. The video is then sent to your smartphone via your Wi-Fi router and the cloud. If you’re looking for a nanny cam or something to monitor your pets, this isn’t it. But the Homeboy does more than send a video clip to your smartphone. You can designate a group of people—a posse—that will receive the same alerts and clips once they install the Homeboy app on their smartphones. Each posse member can be either a Chief (with complete control over all the Homeboys at a given location and the ability to invite others into the posse) or a Deputy (who can arm and disarm cameras, but can’t change any of their settings). Provided you can convince friends, family, or a good neighbor to join your posse, this is about as close as you can get to getting central-office alarm monitoring—a service that can cost $15 per month or more from ADT, Vivint, or a similar company— for free. You’ll want to be the primary contact, but if your smartphone battery is dead, you’re out of range of a cell-phone tower, you forget your phone, or some other circumstance causes you to miss an alert, someone will be able to take action when they see a stranger inside your house. Provide an emergency number and a button will appear with each alert giving you one-tap access to that resource. The smartphone app provides one-touch access to whatever emergency number you define. And if central-office monitoring is something you want, Richards tells me that Homeboy will offer an atypical subscription service early in 2015. Richards didn’t provide guidance on pricing, but he said users won’t have to sign long-term contracts, and they’ll be able to buy the service in small chunks of time. If you’re going on vacation for a week, for instance, you’ll be able to buy a week’s worth of monitoring. If the Homeboy produces an alarm, the service will attempt to reach you or someone on your posse first. If they can’t get in touch with anyone, they’ll call your local police dispatcher and report the alarm (what the dispatcher will actually do depends on that law-enforcement agency’s policy on burglar-alarm response). You can arm and disarm the Homeboy manually using the app on your smartphone, but it’s much easier to use the app’s geo-fencing feature. When you input the camera’s address location into the app, it will automatically arm the camera when you cross a predetermined perimeter—provided you take your smartphone with you, of course. The camera’s housing is one part plastic and one part polished metal. The metal is important because Homeboy’s base contains a powerful magnet. 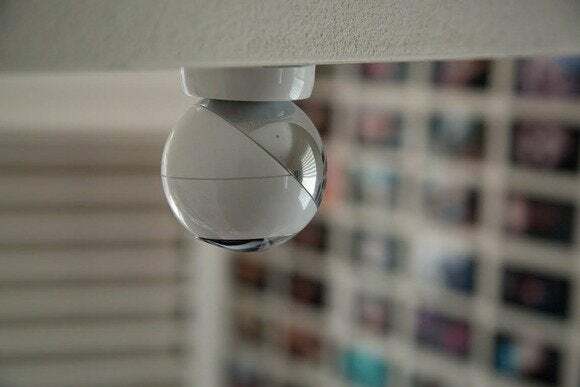 Hang the base on the wall or set it on a flat surface, and the magnet will hold the camera in place at almost any angle (that’s where its spherical shape comes into play). The magnet is surprisingly strong, but it might not withstand the shaking of a significant earthquake. You can take advantage of the Homeboy's IFTTT support to integrate it into the rest of your smart-home system. The speaker grill in the metal is for the onboard siren, which isn’t terribly loud (it’s rated at 81dB at one meter), but it’s enough to draw an intruder’s eye to the camera and hopefully persuade them to leave once they realize they’ve given a security camera a full frontal. Finally, the Homeboy can be integrated with other smart-home systems that support IFTTT recipes. If you own a smart light switch or bulb (something from Belkin’s WeMo or Philips’ Hue lines, for instance) you can use the Homeboy’s motion detector to turn on a light. Or you can create a recipe that will trigger a louder stand-alone siren. Again, this isn’t a full review, but I do want to identify a couple of reservations that I have about the Homeboy based on my early impressions. Its video resolution is limited to 640x480. If the intruder is far away from the camera, it might not catch enough detail for its clips to be useful as forensic evidence. And there is no Homeboy web portal, so you’re limited to viewing video clips on your mobile device (you can also receive text-only email alerts). Its field of view is somewhat limited: 52.9 degrees on the horizontal and 41.2 degrees on the vertical, and its motion detector has less than 15 feet of range. Finally, it’s limited to operating on crowded 2.4GHz Wi-Fi networks (although it doesn’t need a lot of bandwidth). You’ll find cheaper IP cameras—the Homeboy is priced at $149—but its unique feature set renders it a powerful security tool. I’m looking forward to a hands-on review once its firmware and smartphone app have been finalized. The camera is on sale now, but it won't ship for another week, and the software remains in beta. What do you think of the Homeboy's potential? Does it deliver the features you’re looking for, or do you think you’d be better served by a conventional IP camera? Share your thoughts with us in the comments section, below.